Rasoul Bodaghi, a member of the Teachers’ Association, is one of the activists arrested during the 2009 protests in Iran. In September 2009 he was sentenced to six years in custody and has been held in prison ever since. In addition to being imprisoned he was banned from any “social activity” for five years. During his time in prison Mr Bodaghi has been repeatedly held in solitary confinement, including a five months’ stretch in 2015. 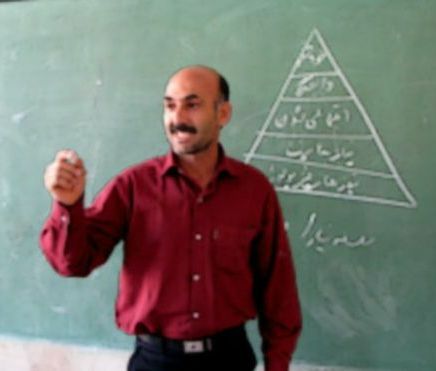 Rasoul Bodaghi is a high school teacher in Eslamshahr, a town in Tehran Province. His employer, the Education Department of Tehran Province, has sacked him because of “absence [from work while in prison! ], presence in teachers’ protest gatherings, activities against the [Islamic] system and action against national security”. In September 2015, at the end of his jail sentence, Branch 28 of the Revolutionary Court, presided by Judge Moghiseh, sentenced Rasoul Bodaghi to a further three years in jail. He is therefore still held in Evin prison. The Iranian regime is increasingly using the tactic of adding more years to a political prisoner’s sentence, when he or she is to be released, in an effort to create uncertainty and to dampen the social movements demanding rights for workers, women, national minorities, students and so on. There are at least a further six teachers’ rights activists in the Iranian regime’s prisons. These include Behnam Ebrahimzadeh, who in December 2014, after having served four out of his five-year sentence, had his sentence increased to nine and a half years by a kangaroo court. He had been active defending workers’ rights and the rights of children – particularly child labourers. Other jailed teachers include Ali-Akbar Baghbani, Esmail Abdi and Alireza Hashemi. The case of Rasoul Bodaghi is one of the handful that the Shahrokh Zamani Action Campaign (SZAC) is currently publicising to highlight the plight of all political prisoners in Iran.